We examined whether two G protein-coupled receptors (GPCRs), muscarinic M1 receptors (M1Rs) and dopaminergic D2 receptors (D2Rs), utilize endogenously released fatty acid to inhibit L-type Ca2+ channels, CaV1.3. HEK-293 cells, stably transfected with M1Rs, were used to transiently transfect D2Rs and CaV1.3b with different CaVβ-subunits, allowing for whole-cell current measurement from a pure channel population. M1R activation with Oxotremorine-M inhibited currents from CaV1.3b coexpressed with α2δ-1 and a β1b, β2a, β3, or β4-subunit. Surprisingly, the magnitude of inhibition was less with β2a than with other CaVβ-subunits. Normalizing currents revealed kinetic changes after modulation with β1b, β3, or β4, but not β2a-containing channels. We then examined if D2Rs modulate CaV1.3b when expressed with different CaVβ-subunits. Stimulation with quinpirole produced little inhibition or kinetic changes for CaV1.3b coexpressed with β2a or β3. However, quinpirole inhibited N-type Ca2+ currents in a concentration-dependent manner, indicating functional expression of D2Rs. N-current inhibition by quinpirole was voltage-dependent and independent of phospholipase A2 (PLA2), whereas a PLA2 antagonist abolished M1R-mediated N-current inhibition. These findings highlight the specific regulation of Ca2+ channels by different GPCRs. Moreover, tissue-specific and/or cellular localization of CaV1.3b with different CaVβ-subunits could fine tune the response of Ca2+ influx following GPCR activation. Voltage-gated Ca2+ channels (VGCCs) control membrane excitability, gene expression, and neurotransmitter release . Alterations in these cellular functions occur when GPCR-activated signal transduction cascades modulate VGCCs. In medium spiny neurons (MSNs) of the striatum, GPCRs, including M1Rs and D2Rs, inhibit VGCC activity [2, 3]. These GPCRs specifically inhibit CaV1.3 L-current, decreasing the output of MSNs [3, 4] and may have functional consequences for motor control [5, 6]. Although present in MSNs, M1R signaling has been characterized most thoroughly in superior cervical ganglion (SCG) neurons. M1Rs couple to Gαq and phospholipase C (PLC) to inhibit native L- and N-VGCC currents [7–9]. This signal transduction cascade, referred to as the slow or diffusible second messenger pathway, is characterized as pertussis toxin (PTX)-insensitive, voltage-independent, and requiring intracellular Ca2+ to function . Our laboratory has identified arachidonic acid (AA) as a critical effector in the slow pathway . Exogenously applied AA inhibits L-current [11–13], which in SCG neurons most likely arises from CaV1.3 . Moreover, Ca2+-dependent cytosolic phospholipase A2 (cPLA2) appears critical for release of AA from phospholipids following M1R activation; loss of cPLA2 activity by pharmacological antagonists or gene knockout ablates L-current inhibition [15, 16]. Additionally, D2Rs inhibit L-current via a diffusible second messenger pathway involving phospholipase C (PLC), InsP3, and calcineurin in MSNs . While both GPCRs signal through PLC, they share another commonality: their activation releases AA from striatal neurons [17, 18] and transfected cell lines [19, 20]. Therefore, D2Rs may also inhibit L- (CaV1.3) and N-(CaV2.2) currents via a pathway utilizing cPLA2 to release AA. In the present study, we tested whether the M1R and D2R pathways converge to modulate recombinant L-VGCC activity. Human embryonic kidney cells, stably transfected with the M1 muscarinic receptor (HEK-M1) [a generous gift from Emily Liman, University of Southern California, originally transfected by  ] were propagated at 37 °C with 5% CO2 in Dulbecco’s MEM (DMEM)/F12 supplemented with 10% FBS, 1% G418, 0.1% gentamicin, and 1% HT supplement (Gibco Life Technologies). Cells were passaged when 80% confluent. HEK-M1 cells, grown in 12-well plates (~ 60–80% confluent), were transfected with a 1:1:1 molar ratio of CaV1.3b or CaV2.2, α2δ-1 and different CaVβs , using Lipofectamine PLUS (Invitrogen) according to the manufacturer’s instructions. Cells were co-transfected with green fluorescent protein (GFP) to identify transfected cells. Constructs for CaV1.3b (+exon11, Δexon32, +exon42a; GenBank accession #AF370009), CaV2.2 (a10, Δexon18a, Δexon24a, +exon31a, +exon37b, +exon46; #AF055477), CaVβ3 (#M88751) and α2δ-1 (#AF286488) were provided by Diane Lipscombe (Brown University). CaVβ1b (#X61394), CaVβ2a (#M80545), and CaVβ4 (#L02315) constructs were provided by Edward Perez-Reyes (University of Virginia). The D4.4R (#AF1199329) construct was provided by Hubert H. M. Van Tol (University of Toronto). D2R cDNA (#NM_000795) was obtained from the UMR cDNA Resource Center (https://www.cdna.org). Per well, a total of 0.5 μg of DNA (of which GFP cDNA was less than 10%) was used following the methods of Roberts-Crowley and Rittenhouse (2009) . Whole-cell currents were recorded following the methods of Liu et al. . High resistance seals were established in Mg2+ Tyrode’s (in mM): 5 MgCl2, 145 NaCl, 5.4 KCl, and 10 HEPES, brought to pH 7.50 with NaOH. Once a seal was established and the membrane ruptured, the Tyrode’s solution was exchanged for external bath solution (in mM): 125 NMG-aspartate, 20 Ba-acetate, 10 HEPES, brought to pH 7.50 with CsOH. Only cells with ≥ 0.2 nA of current were used. Data were acquired using Signal 2.14 software (CED) and stored for later analysis on a personal computer. Linear leak and capacitive currents were subtracted from all traces. All chemicals were purchased from Sigma unless otherwise noted. FPL 64176 (FPL), nimodipine (NIM), and oleoyloxyethyl phosphorylcholine (OPC, Calbiochem) were prepared as stock solutions in 100% ethanol. Quinpirole (quin) and Oxotremorine-M (Oxo-M, Tocris) were dissolved in DDW and stored as 10 mM stock solutions at − 70 °C. Stocks were diluted daily to the final concentration by at least 1000-fold with external solution. For ethanol-prepared stocks, the final ethanol concentration was less than 0.1%. Data are presented as the mean ± s.e.m. Data were analyzed for significance using a Student’s paired t-test for two means, or a one-way ANOVA followed by a Tukey multiple-comparison post hoc test. Statistical significance was set at p < 0.05 or < 0.001. Analysis programs included Signal (CED), Excel (Microsoft), and Origin (OriginLab). Whole-cell L-currents, from β3-containing L-channels, elicited from a holding potential of − 60 mV to a test potential of − 10 mV, averaged − 4699 ± 279 pA (n = 3) compared to − 9 ± 1 pA for HEK-M1 cells transfected with only accessory subunits (n = 10, P < 0.001). Lack of current from cells transfected without CaV1.3b, confirmed that HEK-M1 cells exhibit little endogenous Ca2+ current and transfection of accessory subunits does not upregulate endogenous Ca2+ channels. Recombinant current was confirmed as L-type by showing sensitivity to the L-VGCC antagonist NIM. NIM inhibited β3-containing currents (Additional file 1A) in a concentration-dependent manner (Additional file 1B). 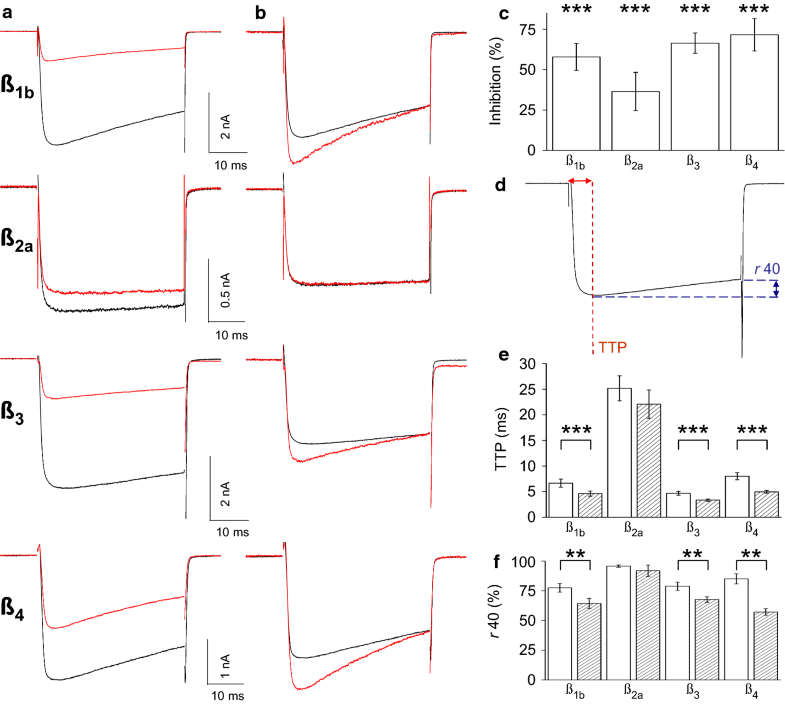 Currents were also sensitive to FPL, which enhanced current from β2a- and β3-containing channels and produced long-lasting tail currents upon repolarization (Additional file 1C, D). Additionally, FPL produced a slight hyperpolarizing voltage shift in the peak inward current and enhanced current amplitude at all voltages (Additional file 1E). Additional file 1F demonstrates that FPL enhanced the long-lasting tail current in a concentration-dependent manner. These pharmacological and biophysical properties show that transfection of HEK-M1 cells with CaV1.3b and accessory subunits produce currents with L-type characteristics. In MSNs, M1R stimulation inhibits L-current in CaV1.2 knockout animals . Only CaV1.2 and CaV1.3 constitute the L-type CaVα1 subunits expressed in brain , implying that M1Rs specifically inhibit CaV1.3 current. Using a cell line transfected with only CaV1.3 channels provides molecular proof for the identity of the inhibited channel. Therefore, to determine if activation of M1Rs inhibits CaV1.3 activity, peak current amplitudes were measured prior to and following application of the M1R agonist Oxo-M. Figure 1a compares representative current traces for CaV1.3b coexpressed with β1b, β2a, β3, or β4-subunits in the absence or presence of Oxo-M. After 1 min, Oxo-M significantly inhibited L-current by 58 ± 8% with β1b; 36 ± 12% with β2a; 66 ± 6% with β3; and 72 ± 10% with β4 (Fig. 1c). Oxo-M elicited kinetic changes that were visualized by normalizing individual traces to the end of the 40 ms test pulse (Fig. 1b), which were quantified by measuring TTP and r40 (Fig. 1d). TTP (Fig. 1e) and r40 (Fig. 1f) decreased following Oxo-M with β1b, β3, or β4; however, no changes were detected with β2a (P ≥ 0.11 for TTP; P ≥ 0.40 for r40). These differences in the magnitude of current inhibition and kinetics suggest that the CaVβ-subunit affects M1R modulation of CaV1.3b. Both M1Rs and D2Rs activate pathways involving G proteins, PLC, and AA release (Fig. 2a). However, whether L-current inhibition by D2Rs shows varied inhibition depending on CaVβ-subunit expression has not been examined. Therefore, we coexpressed D2Rs with CaV1.3b, α2δ-1 and different CaVβ-subunits. While Oxo-M inhibited CaV1.3b-β2a currents over time (Fig. 2b), quin, a D2R agonist, had no effect on current amplitude (Fig. 2c) or kinetics (Fig. 2c inset, g). Since CaV1.3b-β2a current shows less inhibition and no kinetic changes with Oxo-M, we tested whether CaV1.3b-β3 current was sensitive to modulation by quin. Figure 2d shows a time course of CaV1.3b-β3 current inhibition by Oxo-M whereas the time course with quin (Fig. 2e) shows no inhibition or kinetic change (Fig. 2e inset, g). Several concentrations of quin were tested but did not inhibit L-current to the same extent as Oxo-M (Fig. 2f). D2Rs appeared to desensitize with 10 μM quin. Application of quin for 1 min to cells co-transfected with the D2R-like family member, D4.4R, inhibited L-current by 8.5 ± 2.5% and did not produce changes in TTP or r40 (Additional file 2). To confirm that lack of L-current inhibition was not due to poor expression of D2Rs, we repeated the experiment but substituted CaV2.2 for CaV1.3b to serve as a positive control since activated D2Rs also inhibit CaV2.2 [24–26]. Quin inhibited CaV2.2 by 45 ± 7% after 30 s and 48 ± 4% after 1 min (Fig. 3a). Inhibition occurred specifically by activating transfected D2Rs because cells transfected without D2Rs showed no response to quin (Fig. 3a, n = 3). 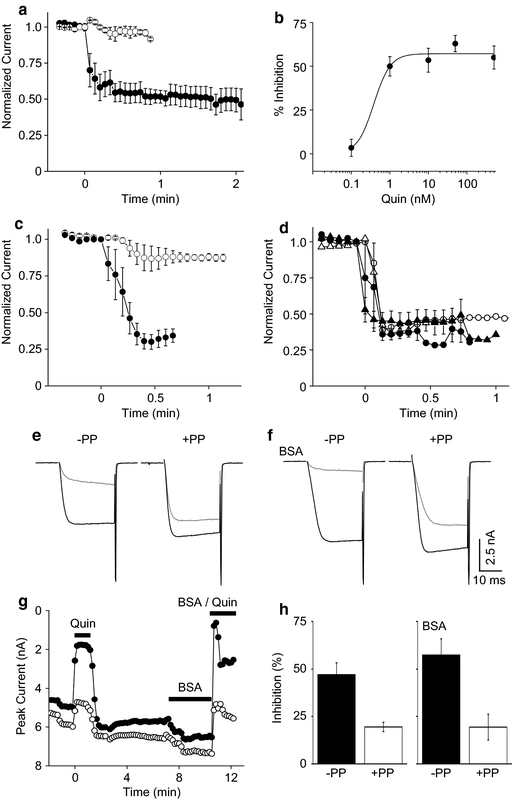 Moreover, N-current inhibition by quin occurred in a concentration-dependent manner (Fig. 3b, n = 3–5). Compared to lower concentrations, 10 μM quin resulted in less inhibition; inhibited current did not recover upon wash, suggesting this concentration causes receptor desensitization (data not shown). Thus, our findings indicate that transfected D2Rs functionally express in HEK-M1 cells to modulate CaV2.2, but not CaV1.3b VGCC activity. To compare D2Rs and M1Rs signaling pathways on CaV2.2 current, we first confirmed that activation of the stably transfected M1Rs could suppress N-current. Indeed, Oxo-M inhibited currents from β3-containing channels by 70 ± 5% after 30 s (Fig. 3c). When incubated with the PLA2 antagonist OPC, cells showed less N-current inhibition by Oxo-M, 14 ± 8% inhibition after 30 s (Fig. 3c). In contrast, low concentrations of quin still suppressed N-current in the presence of OPC (Fig. 3d). 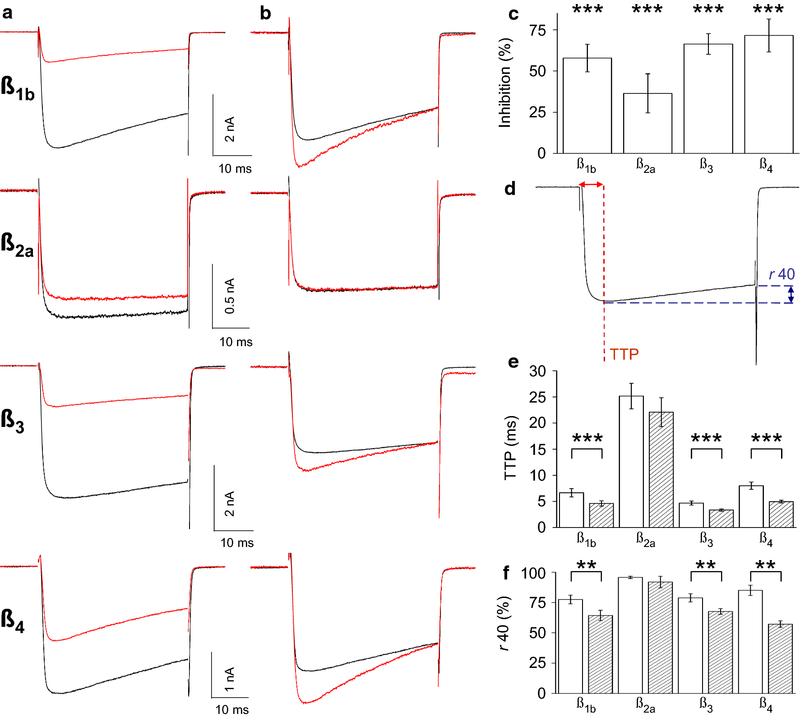 Inhibition was relieved by pre-pulse facilitation (Fig. 3e, g, h) and occurred in the presence of BSA, which acts as a scavenger of free AA (Fig. 3f–h), suggesting that quin mediates membrane-delimited inhibition of N-current. These findings suggest that M1Rs and D2Rs do not share a common pathway leading to N-current inhibition. Previously, the CaV1.3b splice variant of L-VGCCs, found in MSNs, had not been specifically tested for modulation by GPCRs. Here, using HEK-M1 cells, we present the novel finding that M1R stimulation inhibits CaV1.3b L-current with the accessory CaVβ-subunit determining the magnitude of inhibition. In contrast, stimulation of transfected D2Rs with quin does not recapitulate L-current inhibition observed in MSNs . Pharmacological sensitivity to both FPL and NIM confirmed that CaV1.3b expressed in HEK-M1 cells behaves similarly to other recombinant CaV1.3 VGCCs [22, 27]. We also report that N-current modulation by the D2R short splice variant appears similar to membrane-delimited inhibition by the D2R long form . In this form of modulation, when G proteins are activated, Gβγ directly binds to and inhibits CaV2.2 which can be reversed by strong prepulses [10, 28]. Indeed, D2R-mediated inhibition of CaV2.2 was independent of PLA2, whereas blockers of PLA2 abolished inhibition by M1Rs. Thus, the membrane-delimited pathway may be at least partially responsible for the inhibition of CaV2.2 by D2Rs in MSNs . In our experiments, the short splice variant of CaV1.3 (CaV1.3b) was unaffected by activation of D2Rs, expressed in HEK-293 cells, similar to a previous report on CaV1.3a, which has a longer C-terminus . Since neither D2R-long inhibited CaV1.3a , nor D2R-short inhibited CaV1.3b (Fig. 2f), one possibility is that another channel/receptor combination occurs in vivo; however, D2R-long and short equally couple to Gi proteins . On the other hand, CaV1.3a binds a scaffolding protein found in the postsynaptic density of synapses known as Shank . In MSNs, CaV1.3a requires an association with Shank for current inhibition by D2Rs . Although lack of the longer CaV1.3 C-terminus may explain the absence of channel modulation by D2Rs in our studies, we found that Oxo-M inhibits CaV1.3b currents, showing that this short splice variant of CaV1.3 can be modulated by a GqPCR. Therefore, a missing intermediary protein vital for D2R modulation of CaV1.3b may underlie the lack of inhibition reported here, or D2Rs may not modulate CaV1.3b. 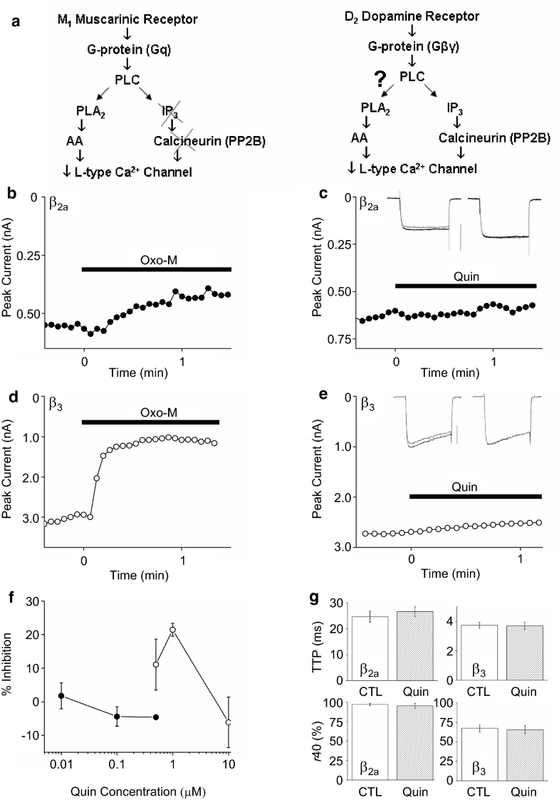 These findings highlight the specific regulation of Ca2+ channels in a CaVβ-subunit dependent manner by different neurotransmitters. While M1R and D2R pathways contain similar signaling molecules and share a common functional output of inhibiting Ca2+ channels, differences between the two cascades exist. Expression and localization of CaV1.3b associated with different CaVβ-subunits in a tissue or cell may dictate how Ca2+ influx is modulated by nearby GPCRs, ultimately affecting Ca2+-dependent processes. Further experiments are needed to determine the differences in signaling between successful CaV1.3b inhibition by M1Rs versus none with D2Rs. MLR conceived of the project, experimental design, collected and analyzed data, and wrote the manuscript. ARR contributed to the experimental design, analysis and editing of the manuscript. Both authors read and approved the final manuscript. We thank José Lemos, Elizabeth Luna, Haley Melikian, Tora Mitra-Ganguli and Edward Perez-Reyes for their feedback. The accession numbers for the constructs used in this study are as follows: CaV1.3b (+exon11, Δexon32, +exon42a), GenBank accession #AF370009; CaV2.2 (a10, Δexon18a, Δexon24a, +exon31a, +exon37b, +exon46), GenBank accession #AF055477; CaVβ1b, GenBank accession #X61394; CaVβ2a, GenBank accession #M80545; CaVβ3, GenBank accession #M88751; CaVβ4, GenBank accession #L02315; and α2δ-1, GenBank accession #AF286488. All data generated or analyzed during this study are included in this published article (and its additional files). Salary support to Mandy Roberts-Crowley from NIH Kirschstein NRSA (5 TS32 NS07366-09). Research supplies and salary support (ARR) were supplied by AHA (9940225N), NIH (R01-NS34195), and from the University of Massachusetts Medical School. 13104_2018_3783_MOESM1_ESM.pdf Additional file 1. Pharmacological characterization of CaV1.3b L-current. HEK-M1 cells were washed with DMEM and the DNA mixture of CaV1.3b, α2δ-1, a β3-subunit and GFP was added and incubated for 1 h at 37 °C in a 5% CO2 incubator. Supplemented media, without antibiotics, was then returned to the cells to bring the volume up to 1 ml (normal medium volume). After 2 h, cells were washed with supplemented media and washed a final time 2 h later. 10 mM MgSO4 was added to the medium to block basal activity of CaV1.3b, which helped minimize excitotoxicity of transfected cells. Cells were transferred 24–72 h post-transfection using 2 mM EDTA in 1X PBS, to poly-l-lysine-coated coverslips. Recording began 1 h after transfer to coverslips. A Individual traces of CaV1.3b-β3 current before (CTL) and after exposure to 0.3 µM NIM. B Concentration–response curve of L-current inhibition to NIM (n = 4–8). C CaV1.3b-β2a currents before and after exposure to FPL (1 µM). Cells were stepped to a test potential of − 10 mV from a holding potential of − 90 mV followed by repolarization to − 90 or − 50 mV. Control (CTL) currents from β2a-containing L-VGCCs show little to no inactivation as observed previously . D CaV1.3b-β3 currents before and after FPL. Cells were stepped to a test potential of − 10 mV from a holding potential of − 60 mV followed by repolarization to − 60 mV. Following FPL, both β2a- and β3-containing channels exhibited slower activation and deactivation kinetics, hallmarks of agonist action on L-current . E FPL enhancement of the CaV1.3b-β2a current–voltage plot from a holding potential of − 90 mV (CTL, filled circles; FPL, open circles, n = 3, *P < 0.05). F Concentration–response curve of CaV1.3b-β3 tail current enhancement to FPL (n = 4–8). Currents inhibited by NIM and enhanced by FPL fully recovered by washing with bath solution (data not shown). 13104_2018_3783_MOESM2_ESM.pdf Additional file 2. D4.4Rs do not inhibit recombinant L-current. A Summary bar graph of CaV1.3b-β3 current inhibition by 0.5 μM quin (n = 5). B & C Summary bar graphs of TTP and r40 kinetic analysis.